This is the third annual RainFurrest charity anthology, published to be sold at the RainFurrest convention in Seattle in late September, following 2011’s Stories of Camp RainFurrest and 2012’s Tails of a Clockwork World. It is also for sale through the FurPlanet online catalogue. The RainFurrest Annual Charity Anthology was created to celebrate and showcase the literary aspect of the anthropomorphics fandom as well as to raise funds for charity. All of the contributing writers and artists have waived all fees so that the totality of the sales can go to the RainFurrest charity of the year. The charity for RainFurrest 2013 is The Clouded Leopard Project, dedicated to the conservation of clouded leopards and their habitat by supporting field research, implementing education initiatives in a range countries, and bringing global awareness to clouded leopard conservation issues. 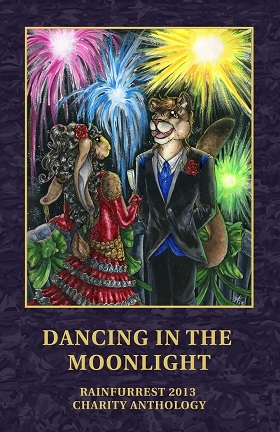 Dancing in the Moonlight, named after RainFurrest 2013’s theme, contains five short stories in teeny-tiny type, four of them illustrated. The book’s cover is by Sarah Alderete. Illustrated, Dallas, TX, FurPlanet Publications, September 2013, trade paperback $10.00 (77 pages). “Dancing in the Moonlight”, the title story by “SeB”, is a traditional fairy story reminiscent of Shakespeare's A Midsummer Night's Dream or any of the tales in Andrew Lang’s collections of 19th-century folk tales. Tony, a medieval fox painter, paints so honestly and beautifully that he wins the love of David, the king of the fairies’ white wolf son, and enters fairyland himself. There is lots of fairyland dancing in the moonlight. In “Fox in the Hen House”, by Mary E. Lowd, Henrietta and all of her coop-mates have been raised from eggs by the Coopmaster, so they have no knowledge of normal henhouse life. The Coopmaster has collected their eggs every day, so they have nothing to devote their maternal instincts toward. When a motherless newborn fox cub stumbles into their coop, Henrietta raises him as her son, and since he does not look like a hen, the other hens decide that he must be a rooster. Henry, the fox, is confused but appreciative of all the attention that he gets from Henrietta, Calliope, Dorrit, and the others. But after all, he is a fox with a fox’s instincts. How long will his training by his foster-mothers and his devotion to them protect them from his basic nature? “There Has Been No Crime”, by co-editor Ryan Hickey, has an anthropomorphic cast, but otherwise there is nothing about it that qualifies it as a furry story. Jonathan West, the middle-aged Chief of Police of a small city, learns from one of his officers that his sister, a nurse at the local hospital, has asked about their criminal investigation into the savage beating of one of their patients. Except that there is no investigation. The police never received a report about the crime. The story is about Chief West’s personal investigation of the incident, what he learns, and what he does about it. It’s a decent story, but making all of the characters funny animals does not really justify this as a furry story. “In a Cat’s Eyes”, again by Mary E. Lowd, is about only two characters; Jason, an exuberant Collie puppy, and Myra, a sedate Siamese cat. Aside from the differences between what a lively puppy and a mature cat would consider important, there is a fundamental difference between how cats and dogs see the world. Both “Fox in the Hen House” and “In a Cat’s Eyes” by Mary E. Lowd were finalists for the 2013 Ursa Major Award in the Best Anthropomorphic Short Fiction category, and the former is a nominee in the 2013 Cóyotl Awards in the Short Story category. My own favorite in Dancing in the Moonlight is “Fox in the Hen House”. Get the charity anthology for some good reading while helping out the clouded leopards. I don't care how many negative votes this posts gets, but that cover is far from the greatest. That face looks derpy. "Fox in the Hen House" by Mary E. Lowd has won the Furry Writers' Guild's Cóyotl Award for Best Anthropomorphic Short Story of 2013.